Born and raised in Massachusetts, I learned from a very early age that it's totally acceptable (if not necessary) for us to express ourselves when it comes to our favorite teams. 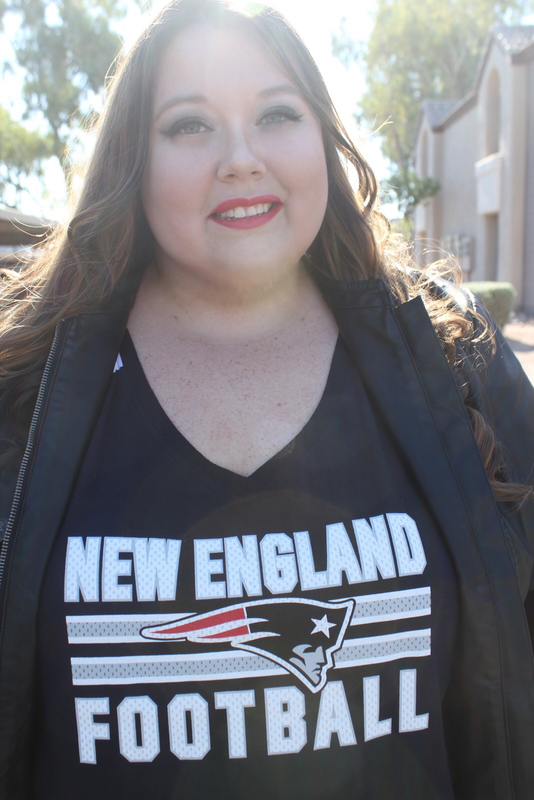 Investing in New England Patriots football gear is important to me because it says what I can't--yes Adam and I have lived in Phoenix for years and we call it home, but when it comes down to it, our roots are in rural Boston. Every Sunday, Adam and I put our crazy work schedules aside for about 3 hours and sit on the couch to celebrate our hometown. Rooting for the New England Patriots is more than a pastime for me; when my husband and I watch the game together, we're living out and celebrating a tradition that we've both had since we were children. Growing up on the East coast, football is more than a sport. It's family. In the past, I have struggled to find jerseys or even just regular t-shirts that not only fit me but also look cute, feminine, and compliment my everyday wardrobe. 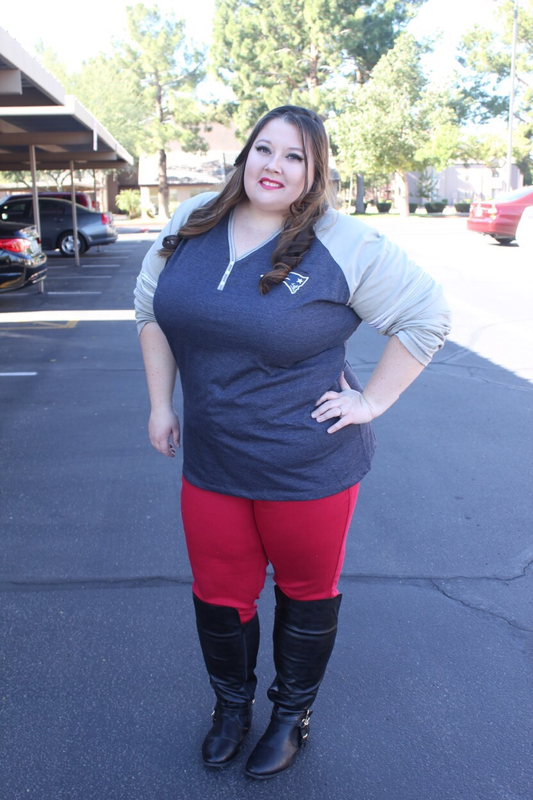 Today, I've partnered with NFLShop.com to share a couple of my favorite, plus size football Sunday outfits to wear! NFLShop.com offers a large variety of sizes ranging from small all the way up to 4X in some styles. If you're here reading this blog post I wrote because you buy plus size clothes like me, I can tell you with confidence that their Women's plus size tops are very true to size; the very first time I shopped the website, I bought a size up because I figured like most clothing it would run small, but when my package arrived I was surprised to see the shirt was too big for me. Before you shop, I encourage you to double check the size chart to ensure you are choosing the size closest to your measurements. Don't feel like you have to wear sweatpants when you're wearing your NFLShop.com gear. Yes, you're watching football, but why make yourself feel frumpy when you can look and feel as chic as you do when you go out for date night? I had some fun going through my wardrobe and finding some trendy and bright clothes to go with my outfit. Colorful jeggings, a leather jacket, bold makeup, and shoes that make me feel fabulous are some of my go-to football Sunday choices. I love showing off my New England Patriots fan style! I wear my Pats clothes with pride--occasionally while I'm running errands around town, I'll be wearing my shirt and a stranger may stop me to ask where I grew up, or someone may even shout "go Pats!" 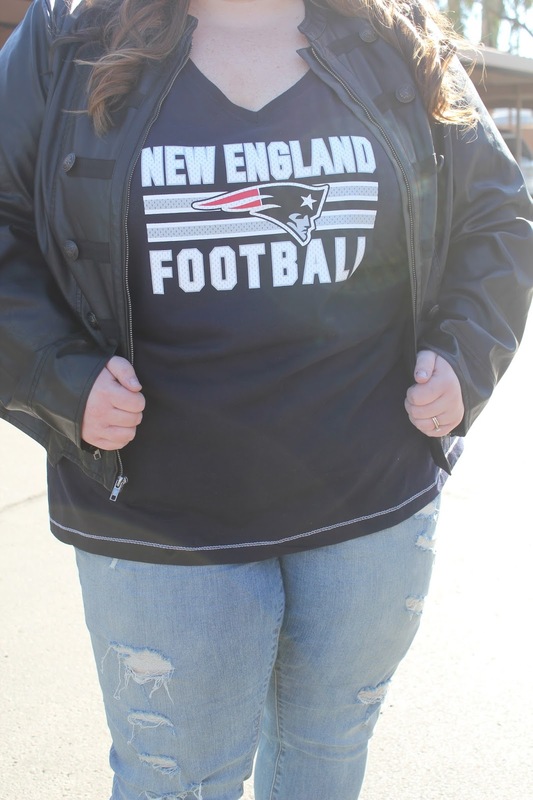 My plus size, NFL fan style is bold, true to myself, and all about my love and support of the New England Patriots family. What's your team? Show off how you support your favorite team on @NFLFanStyle and follow them on social media! OMG, gorgeous! YOU are so dang talented! I totally love this!! I'm so glad those of us who need a plus size have options. I still remember trying to shop a certain plus sized lady story as a teen and going 'ick' at the choices they had in the 1980s. I am all about NFL fashion, although I am a Packers girl! Can I just say that you are rockin; those shoes! As a plus sized Miami Dolphins fan, I am so happy to see they carry bigger sizes! I love those boots too! It pains me to say this, but I love the Pats too! 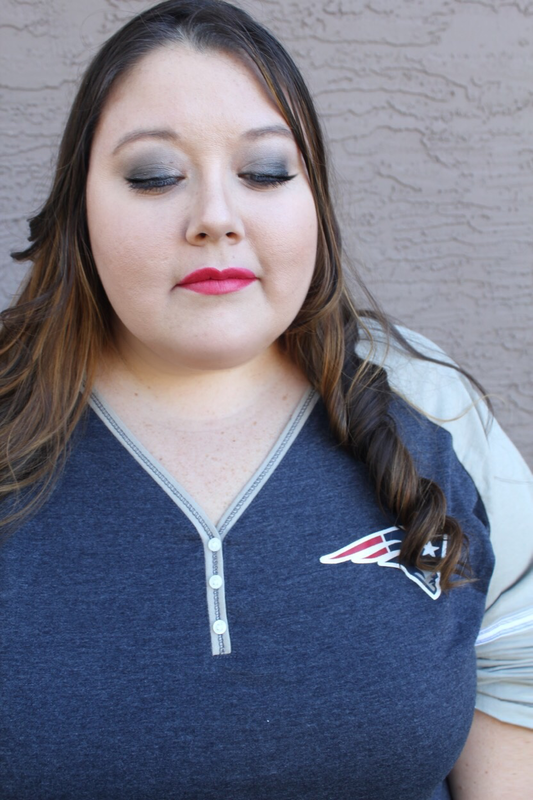 I married into a New Englander family and as much as I don't want to root for them, I love seeing my husband happy when they win so I do, plus Gronk is awesome ;) I love these fashions and will be checking them out! Thanks for sharing! I love how they make so many cute options for us ladies! I remember growing up wearing huge boy shirts. Ugh! Football really is about family to us,too. We cheer and yell at the Packers from SC! I LOVE comfortable jerseys and outfits like those. Although, I would go with something Jets related. We are more into college football, but we do like the Falcons. I know, I know, what can I say...I live in Georgia :) You look amazing!! so cute!! I have a friend who is crazy about the Patriots ;o) So fun!! You look fantastic! Rocking it. Such a fun outfit...those red pants are so adorable on you. Perfect game-day attire. Really cute options - and obviously I'm happy to see that it's the Pats! I'm just going to say...I love Tom Brady ;) Love it!